President Donald Trump on Wednesday visited a thriving military factory in politically vital Ohio, a symbol of his success at enlarging the U.S. defense budget, as he sought to turn attention from his inability to return jobs to a failing car plant elsewhere in the state. The Lima factory, which is set to grow from 400 employees before Trump’s presidency to 1,000 by year’s end, builds Abrams tanks and Stryker combat vehicles. It stands in stark contrast to another nearby symbol of American manufacturing: General Motors’ Lordstown plant, which has been idled due to slow sales of the car that’s built there. Trump has blasted GM CEO Mary Barra over the decision and has also blamed a local union leader for the plant’s closure. In a weekend tweet, Trump attacked a local UAW leader at the Lordstown plant for the factory’s struggles. Democrat Beto O’Rourke, who announced his candidacy for president last week, promptly met with the union leader, David Green, during a swing through Ohio. General Dynamics CEO Phebe Novakovic was among the dignitaries joining Trump in Lima. Ohio, with its 18 electoral votes, has been moving Republican for years, and Trump defeated Hillary Clinton there by nearly 8 percentage points. One of his closest congressional allies has been Representative Jim Jordan, whose district includes Lima. 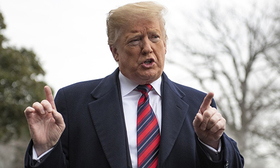 Senator Rob Portman, an Ohio Republican, usually sides with Trump but last week voted to overturn the president’s national emergency declaration over the U.S.-Mexico border.